« Tolga.. the little hamlet with more. 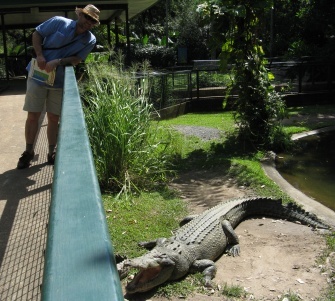 Last weekend, after two years in Cairns, maria and I finally made time to visit one of the region’s premier wildlife attractions, Cairns Tropical Zoo, just north of Cairns near Palm Cove. Neither of us had been to a zoo for ages, and I have to tell you we were quite looking forward to it. We arrived just in time for the free flight bird show at 10:45am. This was a fascinating start to the day, with ‘performances’ by Jack the magpie, a clever Cockatoo, and a couple of raptors, including a massive Wedge Tailed Eagle, arriving and departing low over the heads of the delighted crowd. There are shows and events scheduled around the zoo throughout the day, but generally we were happy to just wander and discover. Of course, there was one more compulsory scheduled stop and that was the morning koala cuddling!! 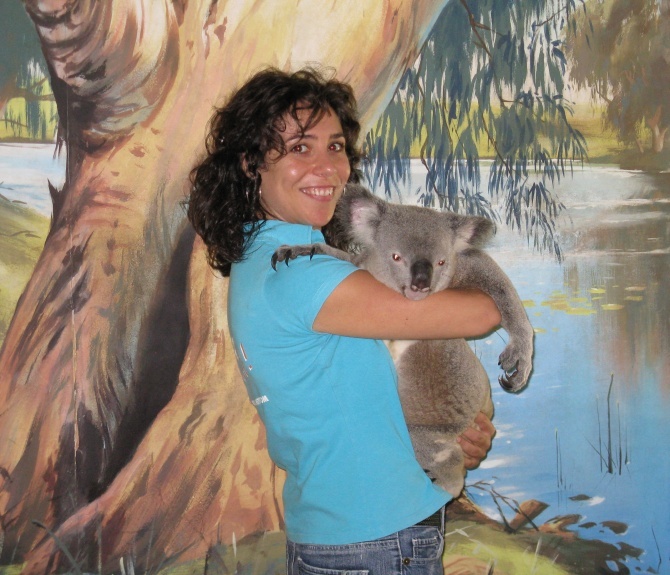 Maria has never forgiven me that she missed out on cuddling a koala when we came to Australia on holidays from Spain four years ago… so there was no option. At first thought, it may seem selfish to exploit these beautiful koalas for our own silly whim. I’m sure given a choice, the koala would choose not to be handled by strangers but to be left to its own devices to sleep in the fork of a tree. But the zoo follows strict guidelines that ensure that no individual koala is disturbed for more than 30 minutes on any given day for ‘cuddling’. And besides, the money that is raised by koala cuddling photos (yes, it costs a little extra) goes towards protecting the koala habitat. Does Does anyone else notice the eerie resemblance between the two? I was hoping to catch a glimpse of the koala’s ancient relative, the Drop Bear, but I learnt that nobody has ever managed to capture a Drop Bear, and they only exist in the wild. We wandered the crocodile and alligator area (”lean a bit more to the left” Maria was calling “I can’t get you in the photo!”) and strolled through the birds aviary. The croc below is one of a number of 4.5 metre monsters that call Cairns Tropical Zoo home, and in the afternoon we watched a very informative croc feeding show. 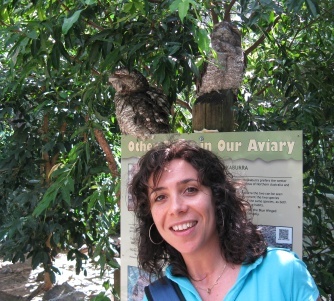 The two birds behind Maria - correct me if I’m wrong - are Papuan Frogmouths. Bird enthusiasts may be interested to take a look at our Birdwatching page. The zoo is proud to house two of these gorgeous and extremely endangered red pandas, and this was one the highlights of the day for me. 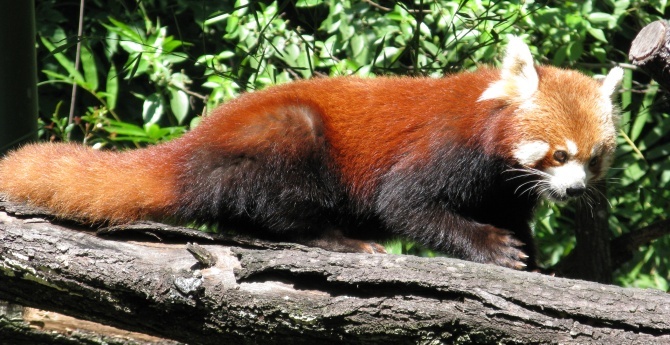 The male of the couple remained stretched out on the roof of their little house, but - to the delight of the crowd - the female came forward to retrieve dates and berries which the handler left in various locations around their enclosure. All in all, it was a terrific day out, and I haven;t covered everything in this short blog entry. There was also the reptile house, the free range kangaroo area, wombats, dingoes, lemurs, tiny, tiny monkeys, a koala ‘maternity ward’, and loads of other beasts to see. Something I should mention was the quality of the food at the zoo’s cafe/restaurant. Normally I dread eating at zoos, theme parks and popular tourists attractions, as the food is normally of the lowest quality and way overpriced. But the salads here were fresh, and loaded with tasty treats like olives and chunks of fetta. The sandwiches were generously filled and equally fresh, and the lasagne was tasty and filling. Prices were on a par with your local corner cafe. 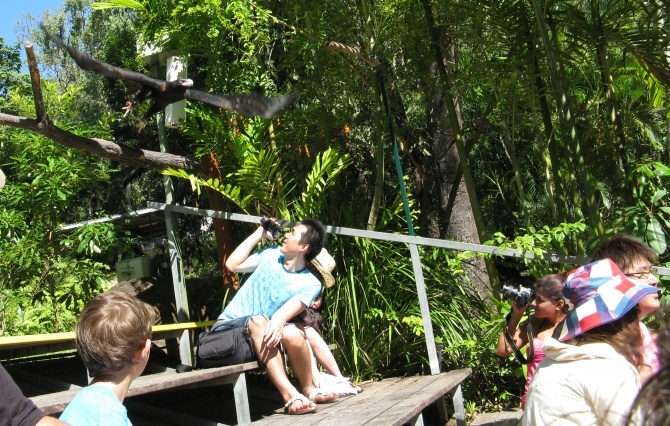 A pleasant surprise, and a great end to our day at Cairns Tropical Zoo! Now we just need to go back and experience Cairns Night Zoo!!! This entry was posted on Wednesday, May 20th, 2009 at 1:53 pm	and is filed under At home in Cairns, Tourist attractions. You can follow any responses to this entry through the RSS 2.0 feed. You can leave a response, or trackback from your own site. The broasd spectrum of dances includes contemporary, classical, ballroom, street, jazz, hip-hop, musical theatre causing all of their sub-genres.